If you are like me....you give to everyone for Christmas. You just can't help yourself, you just love to spread the Christmas joy and spirit to everyone you know. So, with that in mind, you need some little gifts that are adorable and yet inexpensive. So here is something I worked up for inspiration this week. I worked this up for Deedee's Digi's as I am this months Guest Designer. The Gingerbread house is from the collection called Gingerbread Holidays. This set even has an awesome sentiment perfect for the inside of this little matchbook candy holder. So, you are saying WOW I want to make some of these. Well you can-just go here at Splitcoast stampers and make yourself of batch of these fun candy holders. These would make great little party favors for your holiday open house. You could print your family name on the front even Make up a bunch and keep them in a bowl ready to hand out to your holiday guest as they leave. Keep some in your purse to hand to your favorite check-out person at the grocery store or Walmart, the librarian, or your favorite teller. How about tucking in a tip inside for your favorite waitress or hairdresser. It's the perfect little gift to show appreciation at an unexpected moment and they are so easy to make. 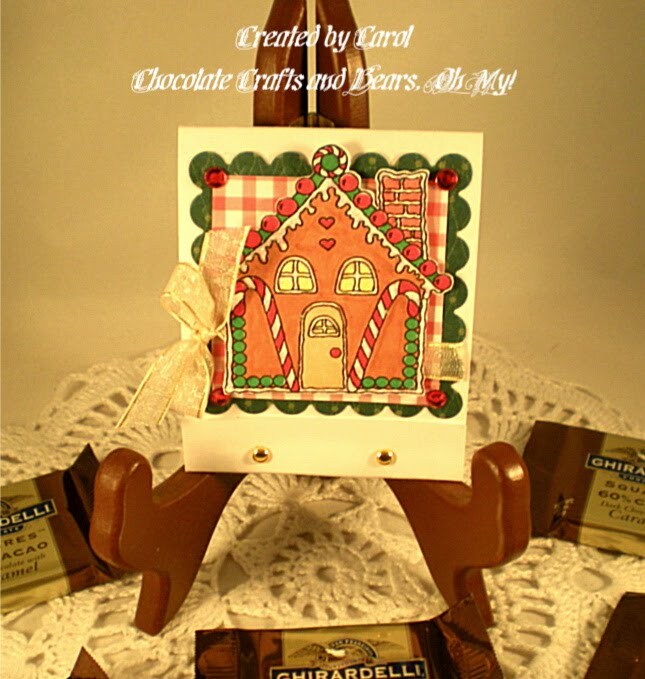 Here is that cute sentiment that I was talking about that is include in the Gingerbread Holidays Set. So what are you waiting for. Get out some pretty Christmas paper (WOW-I guarantee you will use up some scraps you have been meaning to put away!!! lol) and make some of these to keep on hand for an unexpected surprise for some very deserving soul to spread some Christmas cheer! What a fabulous idea, Carol!! I love these little treat holders and your lovely gingerbread house. I'm on board for anything that has to do with chocolate!!! This is really Cute! Love the fact that there's chocolate inside! What a sweet little gift! :) Need my addy?